The Shelburne Falls Trolley Museum, in Shelburne Falls, Massachusetts, is a fun day of trolley car rides, pump car rides and more for the entire family! Visit our operating museum, located near the Historic Bridge of Flowers and the "glacial" potholes in the village of Shelburne Falls. You can take a ride on Trolley No. 10 and our old fashioned pump car (not suitable for small children). In our Visitors Center you can play with wooden and electric trains (suitable for children of all ages), browse historical photos from the time of trolleys and purchase trolley and railroad related items in our TrolleyShop gift shop. Outside you can climb into our big red Caboose, and afterwards stroll among the artisan shops, galleries and restaurants in Shelburne Falls. 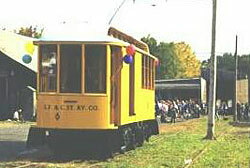 The Shelburne Falls Trolley Museum is dedicated to preserving and operating Shelburne Falls & Colrain Street Railway trolley car No. 10. This car was built by Wason Manufacturing Co. in Springfield MA in 1896. It was delivered new to Shelburne Falls and has never left the valley. For thirty years it served its namesake towns. For twenty years it crossed the Deerfield River on what is now the famous Bridge of Flowers. Saved by a local farmer, it spent sixty-five years as a chicken coop, tool shed and play house. Now, through the efforts of the Shelburne Falls Trolley Museum, you can ride it in the same freight yard where it used to load and unload passengers, apples, mail, milk and other freight, one hundred years ago. The Bridge of Flowers, built in 1908 to carry trolley cars. We have a collection of railroad and trolley artifacts and pictures, as well as an ex-Central Vermont Caboose and several other pieces of rolling stock. 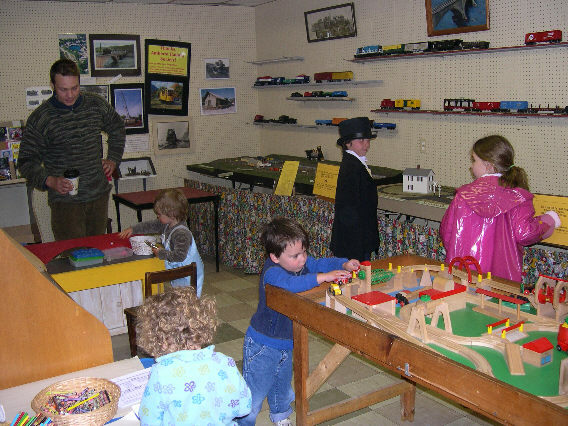 Run wooden and electric model and toy trains in the Kids Corner. 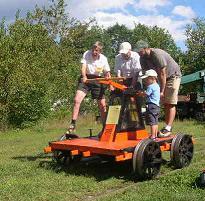 You can also often ride on our antique pump car (not suitable for small children). The museum is an all-volunteer, non-profit organization, funded by memberships and donations, and is open to the public during regular hours and also for parties and field trips. We would also appreciate donations of railroad and trolley artifacts. A Little SF&C St Ry History, a drawing of the car, a Time Table and a map. Photo Gallery Restoration, new arrivals, Trolleyfest, Car 10 running. The Culture Corner, some trolley poems and songs. 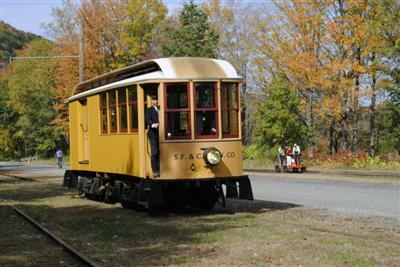 Join The Shelburne Falls Trolley Museum, membership forms and benefits. News Pages from the early days of SFTM (1996 and on). Contact the Shelburne Falls Trolley Museum Phone, Fax, E-Mail, Mail, Driving Directions. I took my granddaughters, age 5 and 7, to the Trolley Museum today. They had a blast. So did my poochie and I. We did it all - rode the trolley, climbed all over and inspected the caboose being restored , pumped the hand car, and the girls had a good ole time running the trains (or moving the Brio ones) as I looked at photos. Plus we all enjoyed the historical descriptions and anecdotes. Lilly, the almost-8-year-old, confessed to me as we were riding on the trolley and she'd just pulled the bell cord that she hadn't really wanted to come to the Trolley Museum. " I thought we'd just climb up some stairs and look and look at things and then climb some more stairs and look and look at more things - like we did at MOMA when Daddy took us to New York. I like this a lot more than MOMA." So much for art. Here are two ways your online shopping can benefit SFTM! Use Giving Assistant to save money and support Shelburne Falls Trolley Museum Inc.
Sign up and shop with Giving Assistant to start donating 3-30% of purchases from your favorite online stores like Lowes, Macy's, and JC Penney. Find Coupons & Promo Codes for Your Favorite Shopping Store at CouponLeak.com and support our sponsor. if you remind him that you heard about his work through SFTM. "Shelburne Falls Trolley Museum" are in the caption, and the photo and/or text are properly credited. To report any problems with these pages, please email trolley@sftm.org.